→Which is the Best Embroidery Machine for Home Business? Which is the Best Embroidery Machine for Home Business? Embroidery machines are used extensively in the textile industry. They are irreplaceable when it comes to making the logotypes of individual companies, advertising companies on working suits, caps, T-shirts, as well as making decorative details on various parts of clothing, decorating the linens, making unique emblems of different types and purposes, etc. In the past, the market offered semi-automatic embroidery machines, and there were only several different templates in the form of perforated, drilled bands. Those were the older models. Later, templates with magnetic media (magnetic stripe-tape) appeared but were rather limited. Today, embroidery machines are fully automated. They are more advanced than the regular sewing machines. You can find specialized embroidery machines for large industries, as well as home sewing machines with optional embroidery features. Embroidery machines for home business have become very popular lately. The possibilities they offer when it comes to creativity are literally endless. They are computerized, can be connected to the computer and different devices. Therefore, the programs can be uploaded from different digital media, directly from a computer or USB memory. Regardless of your status as a beginner or a more advanced user, you will definitely have some doubts when it comes to important features of home-based business embroidery machines. Those features include the size and flexibility of the embroidery area, needles, built-in designs, connectivity, durability and speed of the machine. This is why we are bringing you a complete buying guide to help you choose. If you are planning to buy an embroidery machine for your start-up business, you are probably already familiar with its areas of application. Using this type of machine at home is useful for decorating linens, beach towels, napkins, tablecloths, making unique baby clothes, jackets, and all kinds of clothes and decorative materials that can be opened flat. However, make sure to buy special kinds of machines if you want to embroider stiff caps, clothes with a special and unusual shape, or any kind of clothing that cannot be completely opened. The size of the embroidery area is another very important consideration, especially for a home business. You want to produce the pieces as fast as possible, as this will heavily affect the success of your business. Embroidery area plays an important role in the way and pace you work. Modern embroidery machines for small business come with extra-large embroidery areas and this is something you should look for. Another way in which you can determine the suitability of the working area is the throat width. It represents the space between the needle and body of the machine. In other words, choosing a machine with a wider throat will bring you a large embroidery area as well. You can also use larger hoops. Embroidery machine producers compete in a number of built-in embroidery designs. Today, it is not unusual to see a machine with 250 different built-in designs. However, new technologies, increased and versatile ways of connectivity, as well as state-of-the-art solutions for media transfer impact the way we use embroidery machines as well. USB imports and Internet downloads are the most popular ways of using ready-made embroidery designs, except the built-in models. In order to transfer an image to the machine, you must prepare it, i.e. it must be in a certain format. As we know, “ordinary” photographs in digital format carry the most common formats: JPG, PNG, GIF, TIF, etc. All of these formats are completely useless for embroidery machines. The difference is that the machine formats contain the order of operation of the machine link, the method, the number, and the type of point. If the embroidery is composed of several colors, this format can be used with a specific program. The embroidery machine works in a way that it first completes one color of the given image and then switches to the next one. If your machine supports the PES format, you need to convert the image you have to this appropriate format and transfer it to your machine. Transferring the image to the machine is done in many ways, and this is most commonly completed via the USB memory cards, sticks, original memory cards of individual brands, or CDs. Modern machines can be connected directly to the Internet and you can download suitable designs and formats to your embroidery machine. Furthermore, some machines can be connected directly to a computer. Durability is a valid issue when it comes to all kinds of devices, especially embroidery machines. If you are buying this specific kind of machine, you will definitely use it a lot. This requires a durable, sturdy machine. You should check its frame, the threader quality, and overall material choice before buying your machine. Furthermore, look for a model with a good warranty. Speed is a very important factor to consider if you are not using your embroidery machine in your spare time, or if you use it for your hobby. The number of stitches per minute is crucial for the success and efficiency of your home-based business. This feature directly affects your ability to complete the jobs within the given time frame and to meet the deadlines. It is smart to choose a very fast machine, as you can always slow it down, if necessary. If you are a beginner, you should probably get a single-needle embroidery machine. Such a machine will be enough for your skills and needs. There are several pros and cons of the single-needle machines. For example, these machines are much more affordable than the multi-needle models. They are easy to use and always available in most embroidery and sewing machine ships. On the other hand, they are not suitable for complex designs. If you want to use lots of colors, such a machine will take a lot of time to complete your project, as you will have to change the threads each time you use a different color. It is interesting to point out the difference between the home-business and the industrial embroidery machines here, as the key difference is visible through the number of needles. Industrial machines come with a very large number of needles. Each individual “head” has 10, 15 or more needles. Each needle has its own color. The industrial embroidery machine can work with one or more “heads”, for example, use fifteen heads for complex projects. Such machines are working almost 100% automatically after the operator sets the design. The machine changes the color and cuts off the end by itself. Single needle machines: In the case of the home businesses, the situation is somewhat different. First and foremost, these machines are different when it comes to the number of needles. The basic models have only one needle, as already mentioned. These machines are rather slow. For example, if the given motive has three colors, the machine completes one color of the design and it will completely or partially stop and wait for the second thread (in a different color) to be placed. The machine will then continue the work. When it comes to the multi-needle machines for home businesses, they also have their advantages and disadvantages. Such models are less complex than the mentioned industrial embroidery machines. They have from four to eight needles (usually). Their greatest advantage is the automatic color changing feature. They are fast and very precise machines. On the other hand, these machines are harder to find and more expensive than the single-needle models. The Brother PE770 model is an excellent, state-of-the-art embroidery machine perfect for creative designers who enjoy incorporating different kinds of embroidery into their designs. It provides more than 130 built-in embroidery designs! Furthermore, you can choose between 10 frame shapes and 12 beautiful border styles that will enrich your creations. There are 6 lettering fonts, as well as endless possibilities with the popular mirror feature. You can easily edit all available styles, change the size or angle. The PE770 model by Brother is often chosen by creative designers who work at home. Its vast working area measuring 130 x 180 mm allows working with large embroidery pieces. Furthermore, the new generation of creative fashion designers loves this embroidery machine model because of its built-in memory. This means that you can simply import your designs from the USB and your smart machine will never forget them! How convenient is that? The Brother engineers made this model, especially suitable for fine embroidery works, due to its high precision technology. Trimming the threads was never easier. In addition, users point out that flexibility, limitless creativity, possibilities, as well as durability and ease of handling are the strongest assets of this machine. If you are interested in the types of patterns provided within its 136 different models, these include not only the popular floral motifs, but also geometric, scrollwork, and quilt embroidery elements. We introduced this model as the state-of-the-art type of embroidery machine for the needs of a starting business. You will love its simple user interface, but you will also not want to give up on its reliable LCD, touchscreen, and auto thread cutter. We definitely recommend this model if you are keen on technology and want to have endless possibilities for expressing your creativity through embroidery-enriched delicate and unique pieces of home décor, bags, dresses, as well as jackets. If a multifunctional, computerized machine for home embroidery business with several different feet is what you are looking for, Brother SE1900 model is the best choice for you. This device is actually a combination of sewing and embroidery machine. SE1900 comes with lots of useful features. It has a 3.2-inch touchscreen and an LCD which will make your interaction with the machine easier. The best thing about this computerized machine is the preview option. You can see your work on the display before you actually finalize it. Edit your designs on the screen, change the colors of individual stitches, and decide on the appearance of your final product. Combine different designs, colors, and letters on the screen. This superb feature saves your time, material, and energy. Furthermore, the machine is good for large designs, as its embroidery field expands to a 5 x 7-inch area. Users simply adore the endless choice of stitches – this model comes with 240 different types! Furthermore, SE1900 has 138 built-in embroidery designs, 10 different frames, 10 different styles of buttonholes, 7 English fonts, 3 Japanese fonts, and a Cyrillic font. It is also suitable for different kinds of imports. It comes with a USB port. We said that this embroidery and sewing machine is versatile and multifunctional. You will experience this the best if you use its 8 different feet. It comes with the embroidery feet, button fitting and buttonhole, monogramming, overcasting, blind stitch, zigzag, and zipper foot. This embroidery and sewing machine won the Women’s choice award in 2018. Users adore its bright and large working area, automatic needle threader, flexibility, handiness, user-friendly features, as well as versatility. Janome brand is well-known for versatility. If you own or have owned one of their machines, you know what to expect with the Janome Memory Craft 11000 SE model. However, this machine exceeded the expectations of both users and the critics. Janome Memory Craft Special Edition 11000 type is a three-in-one machine. You can use it as the embroidery machine for your small home-based business, classic sewing machine, and quilting machine. Its precision, versatility, and flexibility allow perfection in these three fields. This machine is the absolute winner when it comes to the built-in stitches. It comes with an amazing number of 358 different stitches and a choice between 13 different buttonholes. There are three fonts. It has the automatic needle threader feature which will save your time, energy, and make your work easier and more precise. This advanced three-in-one machine can be connected directly to the computer. In addition, you can import designs via USB memory key, ATA PC card, or CD ROM drive. Less proficient users will benefit from the on-screen sewing help presented on a superb LCD. When it comes to quilting, you will simply love its revolutionary AcuFil technology perfect for quilt finishes. You can choose between 24 different quilt designs and three different quilting styles. You will quickly become addicted to its quilting hoop, hand-like stitches, and the AcuFil Calculator feature which enables you to print a template. The machine has eight LED lights for extra bright working area. This will enable easy working during the night, without tiring your eyes. Some of its greatest benefits include clothes making guides, embroidery kits, quilting sets, available training panels, as well as lots of needle sets. This machine is your best choice if you want to do creative quilting, standard sewing with lots of different possibilities, as well as beautiful, versatile embroidery designs. If you are looking for a remote computer screen embroidery machine, Janome MB-4S is the best choice. This machine is good for designers and clothes makers who want to control each detail on their designs. The RCS allows editing with more than 65,500 colors! The best thing is: if you have a home business, you don’t have to buy several RCS machines. Owning one Janome MB-4S is enough for more devices, as its RCS can be connected to more than one machine. This model comes with 3 MB of memory. You can use it to store additional stitches or designs. The memory is enough for 100 designs or the amazing 1.5 million different stitches! Users especially value the LED lights of this embroidery machine. They are very convenient for extra-precise work without forcing your eyes. The bobbin winding motor is an extra feature. It is rarely found in professional machines, let alone home-use models. Janome MB-4S type has the bobbin winder which makes your work much easier, even while stitching a design. This machine is very rich when it comes to extras as well. The users will love the extra hoop, as well as the sock hoop kit. It comes with two small and two large hoops. This embroidery machine also comes with 50 different fonts, the auto-thread cutter, four needles, rotation feature, built-in memory, and ten monogramming options. This embroidery machine comes with four needles. It supports the multitasking feature, as you can work on your new projects while the machine finishes the previous one. Excellent compatibility, even with some industrial machine features and requirements, as well as flexibility, launched this model to the very top of the embroidery machines for home use offer. This portable sewing and embroidery machine is perfect for home use by advanced to semi-professional clothes making specialist and designers. It will literally let your creativity free with more than 250 different stitch styles, extra-large embroidery area, and 200 embroidery designs. It also has six different alphabet options. The users, especially, appreciate its bobbin winding motor which stays active even during the embroidering process. SE300 by Singer is good for fast work as well. Its maximum speed equals 800 stitches per minute. When it comes to embroidery, this machine can make up to 700 stitches per minute. Due to this feature and the extra-large embroidery area, finishing even large and complicated projects is extremely fast with this machine. Singer provided lots of useful accessories that come with this model. You will get both large and small embroidery hoop. Furthermore, you get nine different feet. Those include the buttonhole, multi-purpose foot, satin stitch, straight stitch, blind hem, open toe, zipper foot, button sewing foot, and the overcasting foot. Its LCD touchscreen is easy to use and reliable. Furthermore, the owners get free access to online classes which will effortlessly introduce them into the world of this embroidery machine. This is definitely one of the best home-use embroidery machines for crafts. It is flexible, versatile, and easy to use. It comes with the USB port to easily transfer your embroidery designs. The only flaw related to this machine is the fact that it is limited to the US and Canadian market. The warranty is valid only in these two territories. Furthermore, the machine is suitable only for the 110 V power network. Singer is reliable and reputable sewing and embroidery machine brand. They offer a 25-year limited warranty for this model. Which needles to use with a home-based embroidery machine? The choice of embroidery machine needles in the market is versatile. You have to know the type of your machine and always first look for the specifications and requirements by the manufacturer. Next, you should buy the needles in accordance with the material, thread, and stabilizer. General purpose needles are the point ones, but you may need a sharp or heavy duty needle for special projects. You can choose between synthetic and natural threads. This depends on the type of embroidery you want to work on . Furthermore, you can use the popular rayon threads, metallic threads, or neon threads. Rayon threads are the most popular ones, as they are versatile, durable, easy to find, and come in single or multicolor forms. Polyester threads are the most economical solutions, while the silk threads are among the most expensive ones. When choosing the embroidery machine for home business, you should pick a model which is a half-way home-machine and halfway industrial machine, as you will appreciate both the affordability and simple features of the machine, as well as its time-saving and high-end technological solutions. You should pick a machine with a USB port, LCD display, lots of different embroidery designs, as well as some useful automatic features. 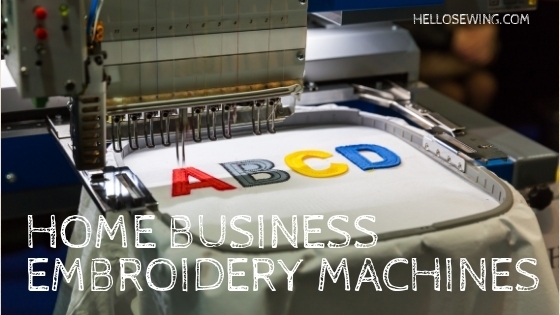 Some of the best embroidery machines for home businesses include Brother PE770, Brother SE1900, Janome Memory Craft 11000 SE, Janome MB-4S, and the Singer SE 300 models.